Ahh, guys..do you know what makes me really happy? I mean, besides the obvious things like food…and food to wash down my food. March. Yes, the mere fact that it is March is enough to put a HUGE cheesy smile on my face for 3 simple reasons. This time of the year is when super quick and easy appetizer recipes l-i-t-e-r-a-l-l-y come to the rescue, cape n’ all . Between St. Patrick’s Day, Easter, and the huge list of Bridal showers that happen around Spring time (perks of having a sister that doubles as a wedding planner), easy appetizers are a must. Hear me when I say easy guys, I seriously mean like 5 ingredient easy. 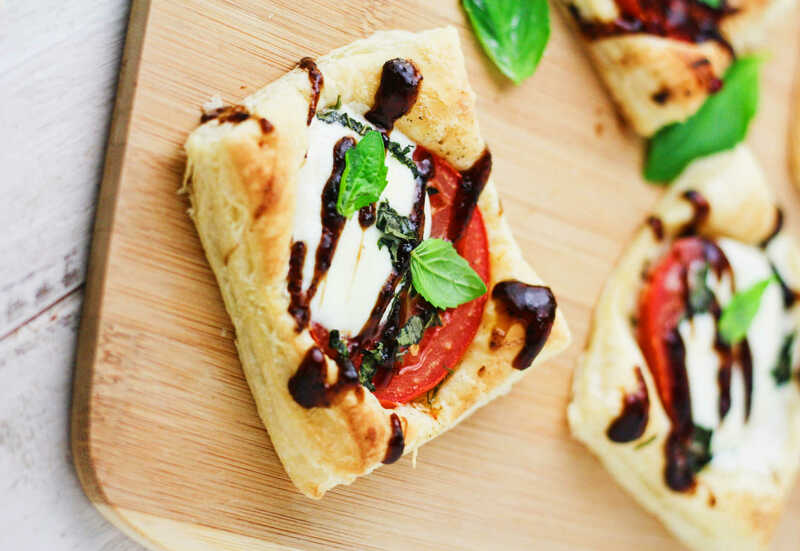 To make these Balsamic Caprese Mini Tarts, I allowed the Puff Pastry sheets to thaw at room temp for about 30 minutes. I then unfolded them onto a floured surface and used a pizza cutter to make 9 individual squares from each sheet – 18 total. I then topped each square with a little sliced tomato and a half slice of fresh mozzarella (fresh is the key here, it makes a HUGE difference compared to the shredded kind). Add a little basil and into the oven they went to transform into something fab. While they were baking, I made a super quick balsamic reduction on the stove. To do this, I just added a cup of fat-free balsamic vinaigrette to a small saucepan and boiled it on medium/high heat until a majority of the vinegar had evaporated. What you’re left with, is a thicker, sweet yet tangy, full-of flavor drizzle that is good on just about ANYTHING. For more ah-mazingly creative ways to use Puff Pastry, check out their website here! Preheat oven at 400 degrees F. Unfold the Puff Pastry sheets onto a floured surface. Sprinkle with Italian seasoning. Using a knife or pizza cutter, cut 3 lines horizontally and 3 line vertically to create 9 even squares. Do this to both sheets to make a total of 18 squares. Line the Puff Pastry squares on a baking sheet and top each one with a slice of tomato, half a slice of fresh mozzarella (approx 0.5 oz) and chopped basil. Bake in the oven for 12-14 minutes or until the pastry has puffed and is golden brown. Add the cup of fat free balsamic dressing to a small saucepan and boil on medium/high heat until a majority of the vinegar has evaporated and the sauce is slightly sweet and thick. Be careful not to allow the sauce to burn. Drizzle over Caprese tarts and enjoy!